Kids discover the world of earthworms! Let children discover the busy subterranean world of earthworms! 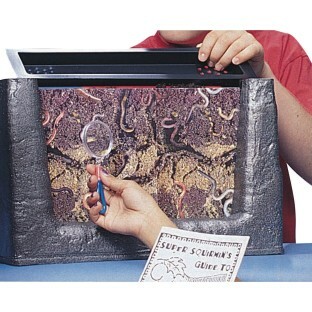 Worms stay safely inside the double-sided viewing unit that includes light shields and an escape-proof tray/lid. Provides absolutely everything needed for experimenting with soil, water, air and light to observe how earthworms live and work, plus detailed instructions and lots of support materials. Award-winning, teacher-developed product! 9-3/4" x 15-3/8" x 5-3/4". Note: Dirt and worms not included. Product does include a voucher for dirt and worms with additional shipping required. My girls and I enjoy this kit. ... My kids were excited to follow the directions to make the worm a nice home. We are interested in seeing our worms' progress. We even plan to bring it to a scout meeting to observe as part of the Watching Wildlife Brownie try-it.